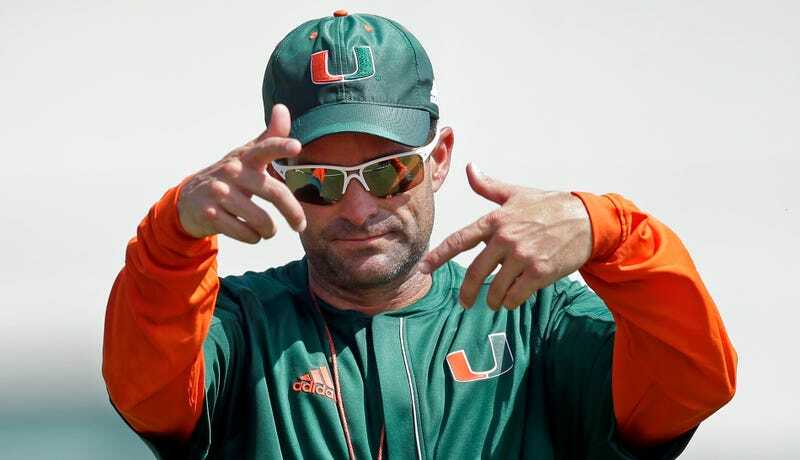 Miami Hurricanes defensive coordinator Manny Diaz had accepted the head coaching position for Temple on Dec. 13. Although the Canes still had their bowl game later in the month, Diaz was locked in for the early signing period, so as to keep his new school’s recruits and convince them that it was worth staying for his leadership and mission. Uh, yeah, about that. On Sunday night, Diaz, who had signed a five-year contract with Temple, reportedly signed a five-year contract with the Canes. Miami will be sending $4 million to the Owls to satisfy his buyout clause. The school essentially paid more money, on top of a new contract, to promote its own defensive coordinator. This is also a guy who has never been a head coach before. All of these coaches can do whatever the hell they want. As for the college football players—well, even though each one of these coaching moves would affect their playing time, careers, and lives, they’ll need to sacrifice a season of eligibility if they want to transfer, or have to prove they deserve an exemption or waiver. The NCAA wouldn’t dare to let “student-athletes” break their commitments so easily. You know, the commitments they made to play for free, even though Diaz’s buyout clause alone could pay a living wage to a program’s entire roster. Maybe it’s time for Temple to give another look at Ed Foley. Yes, he coached the Owls to a 56-27 Independence Bowl loss to Duke, but he sure was happy to be there.